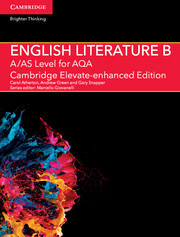 A new series of bespoke, full-coverage resources developed for the 2015 A Level English qualifications. Approved by AQA, this print Student Book is suitable for all abilities, providing stretch opportunities for the more able and additional scaffolding for those who need it. Helping bridge the gap between GCSE and A Level, the unique three-part structure focuses on texts within a particular time period and supports students in interpreting texts and reflecting on how writers make meaning. An enhanced digital version and free Teacher’s Resource are also available. 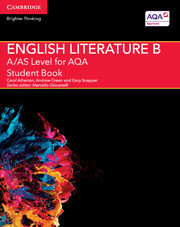 Easy to navigate, differences between AS and A level content clearly explained. Concise definitions of the key terms that students need to know are included and where possible accompanied with contextualised examples. Includes a range of activities to engage the learner. Regular self-assessment opportunities for students throughout each unit, helping students understand their areas of strength and improvement. 20.1 Why do a non-examined assessment? Russell has been a teacher for many years and for the last few years he has worked as an independent consultant, seeking to improve teaching and learning within English departments. He is a highly experienced teacher-trainer for the Cambridge IGCSE who delivers training courses on the syllabuses in the UK and internationally. He also wrote for the Cambridge University Press IGCSE English Literature course book and teacher DVD . Anne Fairhall has many years' experience teaching A Level English and publishing for secondary English. She has worked as a visiting tutor at higher education level and has authored resources for teachers and students. Marcello is a Lecturer in English in Education at the University of Nottingham. He previously worked in secondary schools as a Head of English, an Assistant Headteacher, a Deputy Headteacher, and a Lecturer in English Language and Linguistics in higher education (at the University of Nottingham, and Middlesex University). He is a consultant teacher for NATE and sits on their post 16/higher education committee. Marcello is the co-author of two A Level English Language textbooks, and has written a number of articles for professional journals as well as having significant research publications in stylistics and applied linguistics. Tom Rank is a former Head of Department and is the author of a number of publications for teachers and students of GCSE and A Level English. Tom writes a regular column for NATE's Teaching English magazine.